Most enterprises rely on VMware to run applications in their vSphere-based private clouds. Many of these same customers also run applications on Amazon Web Services (AWS). Increasingly, customers have asked both companies to make it easier to run their existing on-premises environments alongside AWS, using the VMware software and tools they’ve come to rely on. With the recent announcement of VMware Cloud on AWS, the strategic alliance between VMware and AWS formed in response to this obvious demand is beginning to bear fruit. 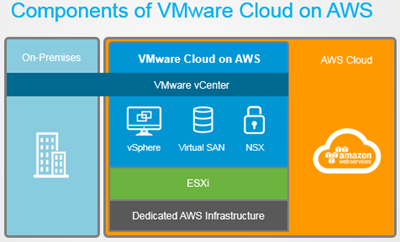 Currently in Technology Preview, VMware Cloud on AWS is a vSphere-based cloud service that will bring VMware’s enterprise-class Software-Defined Data Center (SDDC) software to the AWS cloud. VMware Cloud on AWS will give customers the full SDDC experience from the leader in the private cloud, running on the world’s most popular, trusted, and robust public cloud. Zones will begin offering VMware Cloud on AWS in mid-2017, with pricing available closer to the general availability date. VMware Cloud on AWS will make it easier to run applications across VMware vSphere-based private, public, and hybrid cloud environments using a common set of familiar software and tools, all managed from a single pane of glass with vSphere management. This elastically scalable service will allow VMware customers to use their existing VMware software and tools to leverage AWS’s global footprint and breadth of services, including storage, databases, analytics and more. This new service represents a significant investment in engineering, operations, support, and other resources from both companies. It will run on next-generation, elastic, AWS infrastructure. Customers will be able to purchase services through their existing VMware commercial agreement and use their existing VMware software investments to secure additional loyalty discounts for their VMware Cloud on AWS hybrid environment. VMware Cloud on AWS is powered by VMware Cloud Foundation, a unified SDDC platform that integrates VMware vSphere, VMware Virtual SAN and NSX virtualization technologies, and will provide access to the full range of AWS services, together with the functionality, elasticity, and security customers have come to expect from the AWS Cloud. If VMware Cloud on AWS sounds like the right answer for your environment, your Zones account executive can connect you with a VMware solution specialists form the Zones Advanced Solutions Group who can walk you through the advantages that this integrated solution will deliver. You should also consider having Zones coordinate a VMware vSphere Optimization Assessment that can help you evaluate your environment’s configuration, performance, capacity, and readiness for a potential move to VMware Cloud on AWS in the coming year.